From a Cycles standpoint, all is progressing to expectations. 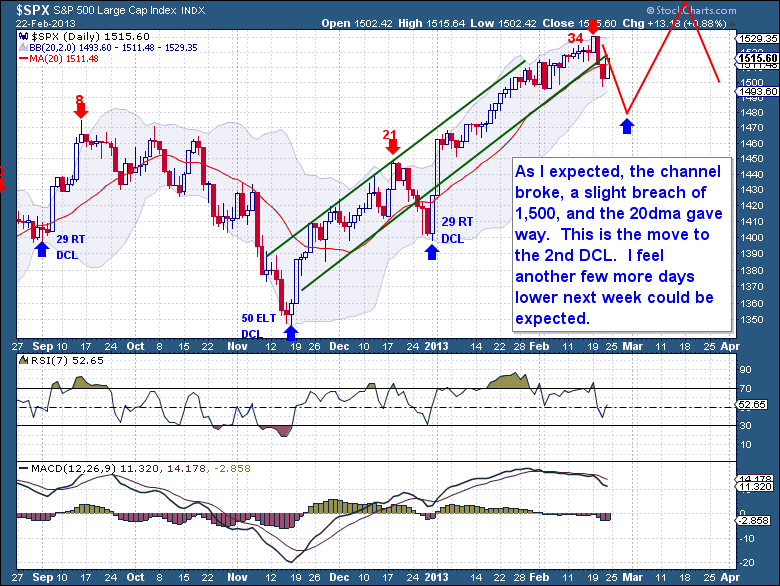 The 30 point drop over two sessions was to be expected after a 34 day rally that hardly came up for air. A Daily Cycle of that strength and length was well due a couple of sessions of profit taking. The question now is if that two day drop was enough to satisfy a DCL, or if one more decline is coming early in the week. On the more important weekly chart, finally I’m seeing cracks in the Investor Cycle appear. Market breadth, which had been stellar up until now, is showing some signs of divergence. The most significant change comes from the amount of stocks trading above their 50dma. What was over 90% of stocks has quickly dived to 75%. In all past cases once this indicator dropped from its peak, it never recovered, and the equity market soon peaked. We also see a decent drop in the stocks making new 52 week highs, while the NYSE McClellan Oscillator is showing momentum is waning. These declines appear to be beyond the natural declines one would expect because of the coming Daily Cycle Low. This brings us to the once mighty Investor Cycle chart with signs of vulnerability now starting to show. The Cycle is now 15 weeks in and we’ve entered the timing band for a top. This means that although we expect further upside, if the highs last week mark the eventual market top, it would not be out of range. Technically the oscillators are beginning to turn over and I expect the coming 3rd Daily Cycle will begin to highlight a natural divergence between these indicators and the markets overall breadth. The final drive into a market top is almost always characterized by fewer stocks participating in the rally and weak internals. I don’t see why this one should be any different. This is an excerpt from this weekend’s premium update published on Sat (2.23) focusing on the Equity markets from the The Financial Tap, which is dedicated to helping people learn to grow into successful investors by providing cycle research on multiple markets delivered twice weekly, as well as real time trade alerts to profit from market inefficiencies.